Traditional departmentalized core subjects continue to exist in education today. There is value in reading, writing and arithmetic! There always will be. But teachers today must appeal to 21st century learners. In a July 2012 article in USA Today Greg Toppo writes "Millions of kids don't find school very challenging". In that same article Toppo quotes Florida State University English education professor Shelbie Witte as stating "The curriculum is just void of critical thinking, creative thinking". As a result students are "probably bored". These themes must be creatively integrated into core subjects by teachers so that students can be prepared for success and ability to thrive in today's workplace. These themes are key in building critical thinking skills in the Common Core State Standards. Schools will no longer be bond to the walls of a classroom; teachers and students may now work virtually to explore and learn what the world has to offer. The teacher will no longer be "sage on stage", but rather a facilitator to help students turn information into knowledge and in turn use that knowledge in a responsible way to better the world around them. Curriculum through the 21st Century is interdisplinary, project based, and research driven. This is an extraordinary time, where the face of education has changed and will continue to evolve as does the world. 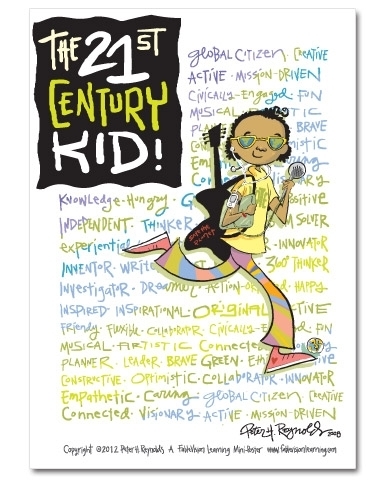 Proudly display this FableVision Learning poster featuring an original illustration by Peter H. Reynolds: The 21st Century Kid. Inspire your students to develop essential skills that will help them move their lives, and the world, to a better place! Whether you've just discovered FableVision Learning or you're a long-time fan of Peter H. Reynolds' work, we urge you to share his vision with this beautiful poster. To order this poster and explore more about Fablevision click on the link here: Fablevision. Thank you to Fablevision for permission to share this poster on US Digital Literacy's website!